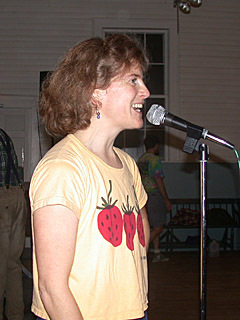 Lisa Sieverts is the caller for the Nelson contra dance on Saturday, June 14th. 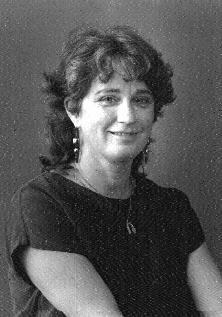 Lisa has been contra dancing since the late 1960s, when she first attended Nelson and Fitzwilliam dances. She has been calling since 1994, and was active in the Idaho and Seattle dance scene before moving to Nelson a few years ago. She enjoys “bridging the gap” between traditional and modern flavors of contra dancing. Providing music for the dance: Mary Lea, of Brattleboro, VT on fiddle, and Gordon Peery of Peterborough, NH on piano. Mary plays many genres of music, ranging from the couple and quadrille music of the 19th and early 20th century, including ragtime, tango and blues, and she also has a repertoire of South American music. Her playing has taken her all over the world, and it will be a treat to have her playing so close to home. She plays in a very rich style, which will be well suited for accompaniment by Gordon’s orchestral piano sound. Everyone is welcome to this dance: if you are new to contra dancing, take advantage of the 1/2 beginners workshop at 7:30. The dance starts at 8:00. Admission is $8.00, $6.00 for senior citizens and students. The Nelson Contra Dance on Saturday, April 12th, features the calling of Mary DesRosiers and the music of the Sugar River Band. Mary is known throughout New England for her excellent teaching and calling skills, which she applies to classic New England contra dances. The Sugar River Band is comprised of Jane Orechowski, who is one of New England’s most accomplised dance fiddlers, and two of her children who have now grown into excellent musicians in their own right. Jane has been playing the fiddle since she was a child dancing and playing for the Swedish Folk Dance Club of Boston at the New England Folk Festival every year. Her daughter Sophie, 17, and son Neil, 14, play fiddle, piano and accordion.The Orzechowskis live in Newport, NH and play traditional fiddle music from New England and Sweden on fiddles, piano and accordion for contra dances, family dances and barn dances. New England dance music is influenced by French-Canadian, Irish, Scottish, English and Cape Breton styles. Sophie has been an apprentice to Bob McQuillen for contra dance piano as part of the apprentice/master musician program with the NH Council on the Arts. She traveled to Norway in February 2005 where she performed as a musician for both Morris and contra dancing for a group of teenage dancers on a cross-cultural exchange program. 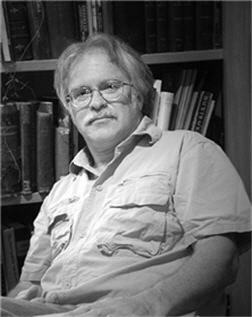 Neil has completed an apprenticeship, also through the NH Arts Council, to Dudley Laufman for calling and fiddling for traditional New England barn dances. Jane and Sophie have each been featured musicians with the Christmas Revels in Hanover, and the Sugar River Band regularly performs at the Revels North Summer Solstice festivals. The band has recorded with Jacqueline and Dudley Laufman on the White Mountain Reel and The Sweets of May, (books and CD’s of traditional American dances) and on the CD, “Where’d You Get Them Chunes?”. Jane is also on three recordings with the band Old New England in addition to several recordings with Sarah Bauhan, Pat Sager, and others. Jane, as part of Old New England, has performed on the Millennium stage at the Kennedy Center, at the U. S. Capitol concert series on the East Lawn, at the Library of Congress, and at the Smithsonian Folklife Festival on the mall in Washington, DC. So, Nelson’s own Don Primrose is calling with the Heathen Creek – who’s going to have more fun? The dancers! What a night this is going to be. If you haven’t heard this band, grab a sound-sample right here. 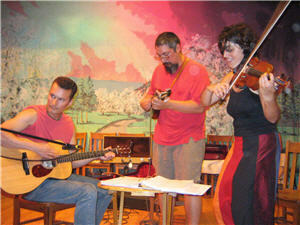 Heathen Creek hails from various parts of New England: mandolin player Mark Koyama from Western Massachusetts, guitarist Pete Johannsen from Boston, and fiddler Maia Rutman from the Upper Valley of New Hampshire. Since their first jam on a New York hillside almost seven years ago, they’ve been playing their own special brand of high-energy music, leaving a trail of blissfully tired dancers in their wake. All avid contra dancers, the Heathens lay traditional Irish, French Canadian, and Old-Time tunes on a bed of hard-hitting rhythm, creating a unique, sock-knocking sound. The monthly 1st Saturday Peterborough Contra Dance will be held December 1st, 8:00-11:30pm at the Peterborough Town House. This month David Millstone will be calling with Old New England providing the music. Singing, dancing, and seasonal mayhem! Opens with a concert at 7:00, with contra dancing and other fun following at 8:00. Everyone is welcome – experience is superfluous! Bring a favorite holiday refreshment for the dessert pot luck. For information, please Email MFS. Nat Hewitt has been described as a demon fiddler with a glint in his eye, playing in a style that is grounded in New England tradition and further informed by both rock & roll and jazz. Liza Constable throws some mean driving guitar chords underneath the tunes, rendering them highly danceable and giving a unique perspective for the ear of the beholder. Glen Loper fills out innovative textures and harmonies with tenor banjo and mandolin. Lisa Sieverts has been calling contra dances for twelve years and provides a rock-solid foundation for learning and enjoying contra dancing. We will be presenting our annual Nowell Sing We Clear concert 8:00pm December 7th, Dublin Community Church, Dublin, NH. Admission: $12 in advance (and for Sr/Jr/) $15 at the door. Special holiday refreshments available! Click here to buy your tickets now. In its 33rd year, this event has become a local tradition in its own right – a celebration of songs, carols. stories, and customs. The program consists of two parts: The Christmas Story (as you may have never heard it before) and a look at “pagan” solstice traditions. Drawn largely from English-language folk traditions, the songs tell a version of events and characters involved in the Christmas story, and detail the customs which make up the twelve magical days following the return of the light at the winter solstice. Many of these ancient customs are the basis of today’s holiday’s traditions: visiting and feasting, gift-giving, carol singing, travling, and the adorning of houses and churches with garlands of evergreen.